URGENT! Take Action TODAY (12/27)! 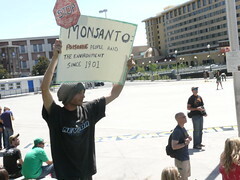 Posted on December 27, 2011 by occupyreno | Comments Off on URGENT! Take Action TODAY (12/27)! Today we have a call of action by the 99 percent for the support of the 99 percent. A local family is asking Occupy Reno to help them get their house back. We will not sit idly by and allow big banks to take away yet another home of hardworking citizens. We demand justice, and we need YOU! The Vieira family needs your help at 10 a.m. today at 200 S Virginia Street in front of Wells Fargo Bank to help fight to get their home back and hold Wells Fargo accountable for its predatory lending practices. Read their press release below! Reno Homeowners Face off with Big Banks, Call on Attorney General Masto to Act, Reno, Nevada – Donna Vieira, her husband Nuno and their six year old son, Leonardo never knew the loan they had been given by Wells Fargo 6 years ago would lead them into the fight of a lifetime. The Vieira’s are first generation immigrants, hard working small business owners, veteran and members of ACCE who purchased their Reno home in 2005 with the hopes of creating a new life for themselves and their then infant son. That dream of a new life quickly turned into a horror story when the Vieira’s allege they were sold a fraudulent mortgage loan by Banking giant, Wells Fargo. “We did everything right in pursuing and preserving our American Dream. However, for the past 6 years, facts and people’s sufferings are not relevant to “Too Big Too Fail” banks said Donna Vieira, a first generation immigrant fighting to save her Reno home from impending foreclosure. Like so many other Nevada families now suffering through the foreclosure crisis, the Vieira’s were victims of both real estate appraisal and loan origination fraud, leaving their Reno home $243,000 under water before the ink dried on their closing settlement. Wells Fargo refused to correct its own mistakes. Instead, it chose to wrongfully foreclose on their home. But, unlike other families who have simply walked away, the Vieira’s chose to fight back. Their fight has taken them through a lengthy legal battle in which the two first generation immigrants have pitted themselves against one of the most powerful Banks in the country, setting the stage for a David vs. Goliath fight that could cost their family everything. The Vieira’s are part of a growing chorus of Nevada residents and advocates calling on Attorney General Masto to launch an investigation into Wells Fargo’s predatory loan practices, subsequent handling of the ongoing foreclosure crisis and intervene on behalf of the Vieiras on their Nevada Supreme Court Case 53690. The family has gone so far as to begin distributing a petition to demand further investigation into cases like theirs. “Today, we demand that if you rip off the poor and the working middle class and if you break the law, you will be held accountable. You will go to jail just like Madoff! “Too Big Too Fail” banks shall NEVER be “Too Big Too Jail.” The family is asking supporters send an email to the Nevada Attorney General Catherine Masto (jlopez@ag.nv.gov) and to the Nevada Supreme Court (nvsclerk@nvcourts.nv.gov) and demand the Supreme Court Judges to uphold the laws on their Supreme Court case 53690 and keep the Vieiras in their home! PLEASE call AG Masto to investigate Nevada Supreme Court case 53690 and hold Wells Fargo accountable for its predatory lending practices! Call Nevada Supreme Court Judges to uphold the state laws and let justice prevail! Please join us today, December 27, at 10 a.m. outside Wells Fargo at 200 S. Virginia as we rally behind this local family’s cause! Comments Off on URGENT! Take Action TODAY (12/27)! 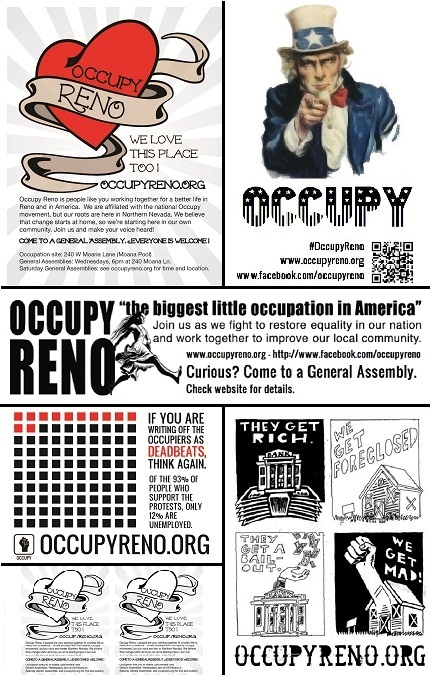 GA Reminder and Happy Holidays from Occupy Reno! 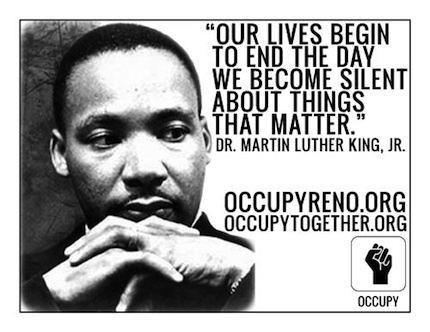 Posted on December 23, 2011 by occupyreno | Comments Off on GA Reminder and Happy Holidays from Occupy Reno! Wow, time flies! We are already over three months into this movement, well into the holidays, and just about a week away from the new year. While many of us will be out of town in the next week, we will still be having our regularly scheduled General Assembly tomorrow beginning at 1 p.m. in Brick Park (1st St. and Center St. next to Java Jungle) as well as Wednesday’s General Assembly at 6 p.m. at 240 Moana Lane. We may or may not reach quorum, but we’d still love to see your smiling faces and hear your ideas about the direction of Occupy Reno in the future. We will not be having our weekly Occupy Your Yoga Mat classes tomorrow or New Year’s Eve before the GA, but they will start up again the first Saturday of 2012. Also, there will be a Christmas dinner around noon at the occupation on Sunday, the 25th. Please show your support for the occupiers by dropping by with leftovers, warm drinks, or sharing in some campfire conversations if you can! We wish you all very Happy Holidays, and don’t be afraid to bring up the movement as you visit loved ones. We all have much more in common than we do different! It’s a great time for them to relate to the movement on a more personal level- through you! 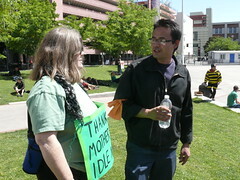 Comments Off on GA Reminder and Happy Holidays from Occupy Reno! Just a reminder that the General Assembly is tonight at 6pm at 240 W. Moana Lane. Bring a coat and the motivation to change the world! See you there. P.S. We are looking for more Facilitators. If you are interested please shout and wave your arms crazily once you arrive. The Outreach Meeting is tonight at 5:30 in Strega, 310 South Arlington Avenue Reno, NV 89501.